There will be several focused sessions on AI for ATP, ITP and mathematics, modern AI and big-data methods, and several sessions with contributed talks. The focused sessions will be based on invited talks and discussion oriented. Dennis Müller, Florian Rabe and Michael Kohlhase: How to Leverage a Large Dataset of Formalized Mathematics with Machine Learning? Bartosz Piotrowski, Chad Brown, Josef Urban and Cezary Kaliszyk: Can Neural Networks Learn Symbolic Rewriting? Giles Reger and Martin Suda: Can a Failed Strategy be Useful? AITP solicits contributed talks. Selection of those will be based on extended abstracts/short papers of 2 pages formatted with easychair.cls. Submission is via EasyChair (https://easychair.org/conferences/?conf=aitp2019). Accepted contributions will be published in an informal book of abstracts for distribution at the conference. We will consider an open call for post-proceedings in an established series of conference proceedings (LIPIcs, EPiC, JMLR) or a journal (AICom, JAR, JAIR). A bus bringing the participants from Innsbruck to the conference center and back is provided. On Sunday the 7th the bus will depart from Innsbruck airport at 10:45am, leave from the central station at 11:15 am and continue to Obergurgl. If you want to join the bus at the train station look for the Info-Point. There, you will find the bus driver with the sign "University Center Obergurgl" as well as some of the University of Innsbruck organizers. If you want to join the bus at the airport, the bus will stop in front of the terminal, it will have the "Obergurgl" sign, and there will be organizers joining the bus as well. We expect to reach the conference center around 1pm, and after checking and lunch the first session will start at 3pm. On Friday the 12th: check-out by 10am, bus leaves at 10:30, arrival in Innsbruck between 12:30 and 13:30 (depends on weather conditions and traffic). The bus will first stop at the airport and then in the city center (main railway station). The conference will take place from April 7 to April 12 in the stunning scenery of the Tyrolean Alps in the Obergurgl Conference Center of the University of Innsbruck. The pictures of the rooms are here. Obergurgl is a picturesque village located at an altitude of 2000m, a 1-hour drive from Innsbruck. It offers a variety of winter-sport activities such as skiing, snowshoeing and hiking at this time of the year. The total price for accommodation in a twin room (based on 2-person occupancy), food (half-board) and registration for the five days will be around 670 EUR. There are also several hotels in Obergurgl - booking early is recommended. 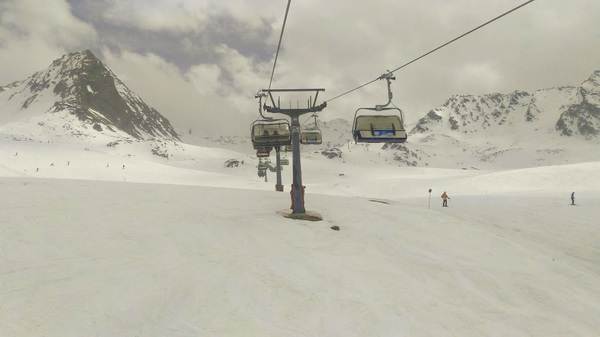 You can rent skis/snowboards/boots/helmets in Obergurgl or already in Innsbruck. It might be hard to rent clothing in Obergurgl, but it is possible in Innsbruck (e.g., here). Ski+Boots rental per day: 30-50Euros per day (depending on the quality). 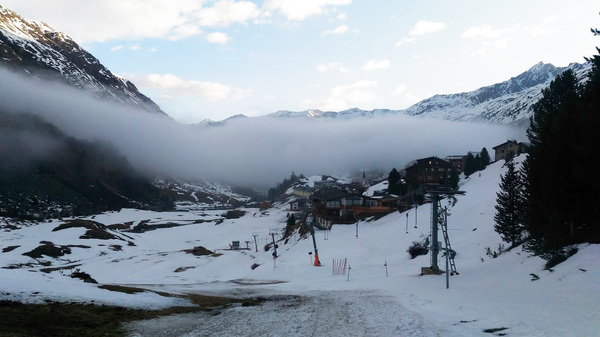 Here are two photos from 2016 showing the skiing conditions and the village (with the conference center hidden on the right side of the photo) taken in April. 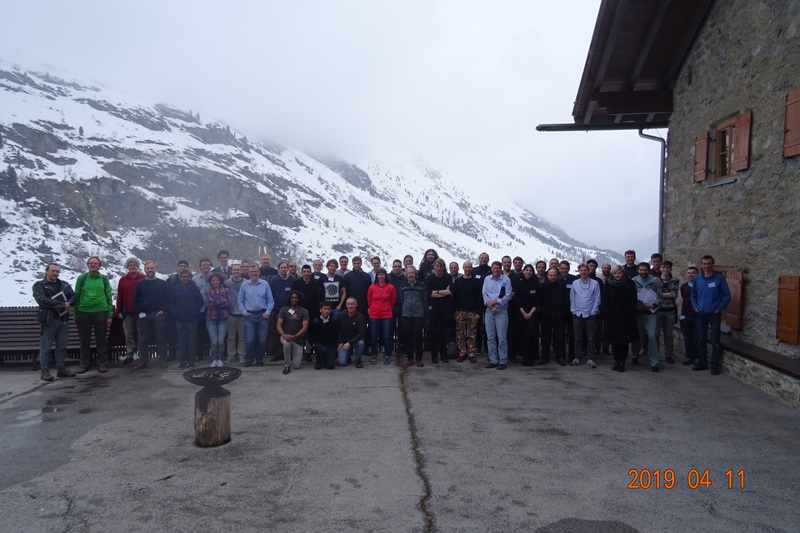 We thank the University of Innsbruck for their support of the Obergurgl conference center.